﻿ Hi Hotel, Ulsan | FROM $49 - SAVE ON AGODA! "Overall, its a good stay as bus station is in walking distan..."
Have a question for Hi Hotel? 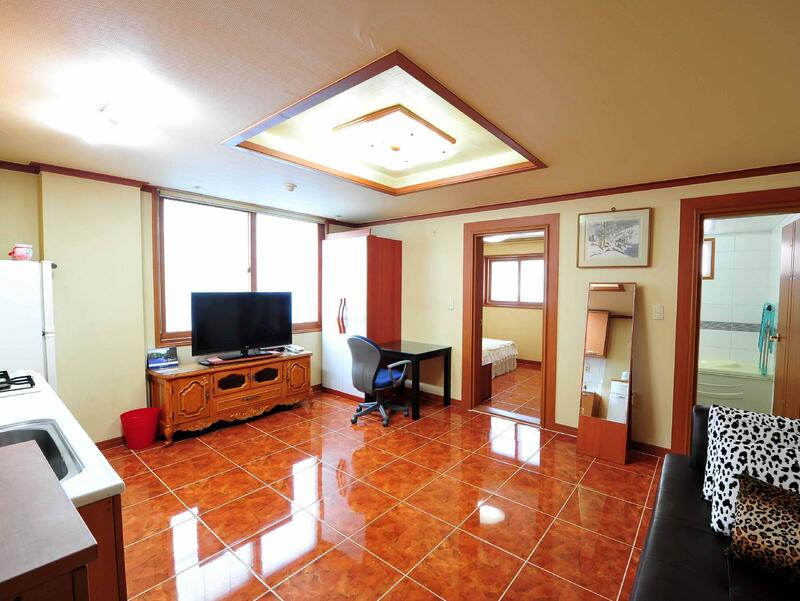 For travelers who want to take in the sights and sounds of Ulsan, Goodstay Hi Hotel is the perfect choice. Situated only from the city center, guests are well located to enjoy the town's attractions and activities. No less exceptional is the hotel's easy access to the city's myriad attractions and landmarks, such as Dong-gu Public Health Center, Ilsan Beach, Daewangam Park. At Goodstay Hi Hotel, the excellent service and superior facilities make for an unforgettable stay. A selection of top-class facilities such as free Wi-Fi in all rooms, 24-hour front desk, luggage storage, Wi-Fi in public areas, valet parking can be enjoyed at the hotel. Goodstay Hi Hotel is home to 17 bedrooms. All are tastefully furnished and many even provide such comforts as television LCD/plasma screen, internet access – wireless, internet access – wireless (complimentary), air conditioning, heating. The hotel offers many unique recreational opportunities such as golf course (within 3 km). Enjoy unparalleled services and a truly prestigious address at the Goodstay Hi Hotel. The place is really tricky to find even for my taxi driver. Overall, its a good stay as bus station is in walking distance. able to communicate in english! superb for korean. since my private trip to ulsan was to meet korean friends i have not seen for many years, i looked for a reasonable hotel close to the area where i worked in the mid-eighties. this is exactly what i fund. however, what i have not foreseen where to find such pleasant attitude well mixed with professionalism from the very minute i went to the hotel’s doorstep. the hotel does not have a restaurant but the room defiantly invites you to cook your own food. do you prefer to eat out there is many restaurants for everyone’s taste only few meters from the hotel. if you have any special needs i am sure that, the owner or the hotel manager will do anything to assist you. considering everything, i definitely fund by far the best solution for my stay. my husband and i went to the hotel because our apartment had no heat or hot water. we arrived really late, but the woman at the reception desk was really pleasant and accommodating. she quickly brought us to our room. the room we were brought to was bigger than we expected. we had a bedroom, bathroom, and to our surprise a living room/kitchenette. the room was very warm and the first night we had hot water. we woke up the next morning to the manager knocking on the door. she wanted to make sure our night was alright and let us know she could help us find things to do. she spoke very clear english. the only thing i was uncomfortable with was when she came into collect another customers belongings that she promised he could keep at the hotel. the hotel was near many little marts. there were also ample places to eat, both korean and western style restaurants. my husband and i were able to walk to the department store. on the way, we found a nice little park, with excellent scenery. when we got back to the hotel we were greeted by the manager and her cute dog. however, we also had no hot water. we asked for help, and the manager said she would fix. after a few hours we still had no hot water. so, ultimately, we decided to leave, but were still charged. overall, for the money the hotel was decent. the room was clean, though the walls were stained and it seemed a bit unorganized. also, some of the electrical outlets were broken. Hotel is very clean, equipped with facilites, nearby department store and restaurant. Was surprised to find our room is like the suite type with living room, pantry and bedroom. Hotel was very clean, the housekeeper came very early in the morning to clean the room. A lot of facilities in the room such as washing machine, fridge and cooker. It was my first time to Korea and found that the floor has heater! We enjoyed our stay there as the owner was very friendly and helpful in giving us tips to speak simple korean language. Do try the seafood in Ulsan as they very tasty and fresh! Hotel staffs are kind. Sometimes communication in English was not perfect. great stay , owner went out of the way to make every thing right and it was one of the best experiences i have ever had dealing with hotels owner/manager are just good people and would do any thing guests, i will be staying there again and again i am sure just great stay. Clean, close to market, friendly owner, free transportation by owner. Was an meinem Zimmer "Deluxe" sein sollte, konnte ich nicht herausfinden. Personal hilfsbereit und sehr freundlich, spricht aber kein english, was alles sehr schwierig macht. Küchen Ecke nicht sehr sauber und eher ungepflegt ! Telefon im Zimmer funktionierte nicht !